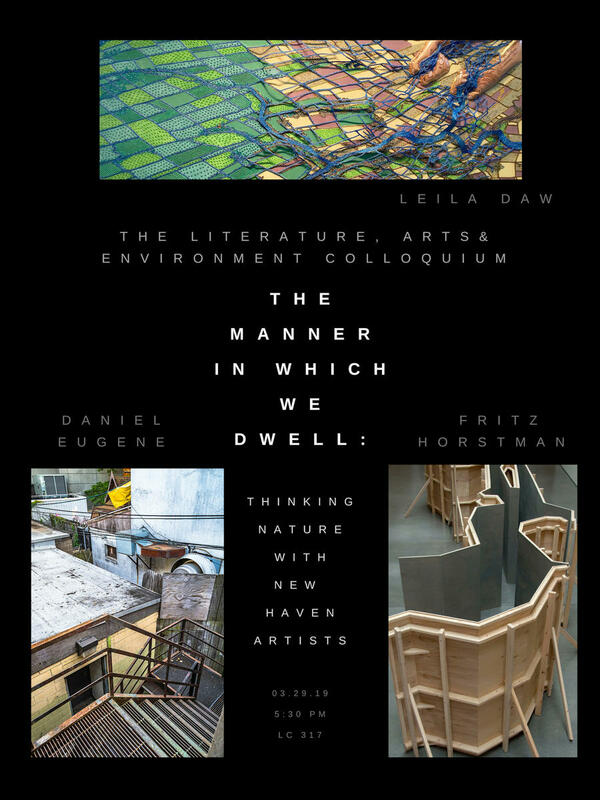 The manner in which we dwell ”gives expression to the essence of our human existence.” In the spirit of being aware of the place in which we dwell, LAE is bringing together a panel of three local New Haven artists (Leila Daw, Fritz Hortsman, Daniel Eugene) who engage with eco-critical approaches to art. The panel will explore questions of how we imagine and construct a sense of place, what it means to belong, and how art mediates and represents our experience of the natural world. In the Anthropocene, we can no longer imagine our planet in terms of linear scale, but need to think of an intermingling between the local and the global–connections between the immediate, the nearby and the global. How can we envision larger concerns of the planet within our space at Yale and in New Haven, and how does our sense of place construct our ecological awareness?